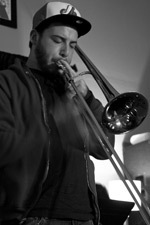 Alex Slomka began playing trombone at Schenectady High School in 2006. 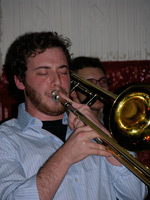 He currently attends the Crane School of Music in Potsdam, NY as a trombone performance major with a jazz studies minor. Up in Potsdam Alex plays in the funk band 'The Third Rail' as well as the jazz and Latin ensembles Crane offers. In May 2010 Alex will tour Mexico with the Crane Latin Ensemble. In August 2010 he will intern at Proctors Summer Jazz Institute with Keith Pray. Slomka's teachers include, Bret Zvacek, Brian Patneaude, Mark Hartman, and Michael Meidenbauer.